Generators are powerful industrial machines that will keep your site operational when you need them most. However, you need to ensure that your generators are in reliable working order if you want them to operate at full capacity. Downtime can be easily avoided if owners, building engineers, maintenance personnel, and factory managers service generators properly. Here are the most commonly-encountered generator maintenance mistakes you should avoid to keep your keep your site up and running in an emergency situation. The most obvious generator maintenance mistake you can make is to neglect to service your generator regularly. Performing regular preventative maintenance ensures that you identify issues before they become major problems, and it keeps your equipment in good running order. Even if you service your generator, you need to service it properly. This includes burning off unburned fuel, changing filters and fluids as needed, testing the fuel, starting, and cooling systems, and checking the engine. 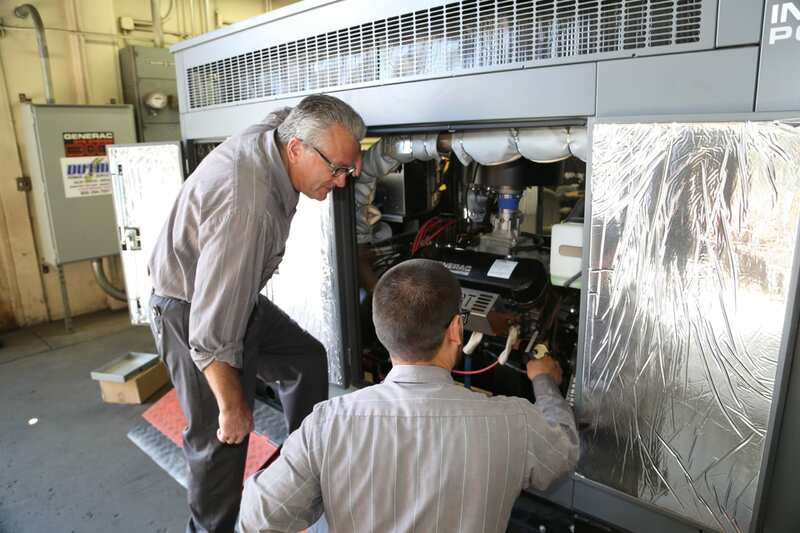 Generator service and repair specialists can advise you on exactly what servicing you need, and the frequency required. Attempting generator maintenance yourself may be risky as you’ll likely miss problems or maintenance checks that a generator specialist would acknowledge. When you’re not regularly using your generator, it’s common for fuel to develop problems within the tank. If you don’t maintain good fuel quality, condensation will cause microbes to thrive and eventually contaminate the tank. This contamination will lead to damage to the fuel injection system. Injection pumps can be very costly to replace. Just as fuel quality is important so is quantity. There must be adequate fuel reaching the tank in the first place. When there’s not enough fuel, the generator will shut down. It is important to have your fuel tank at 90%, leaving room to compensate for expanding of fuel. Just like you wouldn’t leave a car for weeks or months without turning the engine over, you shouldn’t leave your generator off all the time. Running your generator on a regular basis reduces the risk of your generator shutting down, and it draws your attention to other faults in the system. You might think that it makes sense to buy the largest generator you can afford so that you’ll never run out of power. However, it’s not as simple as that. When you buy a generator that is too large for your operational needs, you’re always running the generator at lower loads than it was designed to carry. This can result in excessive fuel waste, and wet stacking. Commonly, running too light a load through your generator causes wet stacking which is an accumulation of unburned fuel in the exhaust system which can be a fire hazard. You may purchase a generator that is currently too large for your operational needs if you plan on expanding and adding equipment in the near future. Performing regular load tests will help alleviate any wet stacking that might happen before more equipment is installed. You change the oil in your car frequently, and a generator’s engine should be no exception. Regular oil changes will keep your engine in the best possible working order. Undertaking tasks such as oil changes keeps your generator’s components moving properly. A lack of lubrication inside the generator causes corrosion and unnecessary wear and tear on the parts. At Duthie Power, we know that generators most often fail because they’ve been improperly maintained. Through regularly-scheduled generator maintenance, our expert team takes the hassle out of servicing for your complete peace of mind. Stop worrying about whether your generator will fire up when you need it–contact us today to see how we can help.